The Wild Chase is an exciting, fast paced, slot that welcomes you to the sun-drenched hillsides by the sea, filled with intrigue and glamour. This action slot by QuickSpin offers a re-spin on every winning combination and boasts multiplier wilds, free spins, cool graphics and music that will set your heart racing. Ready to take a ride on the wild, extravagant side of life? Then let’s check out what this slot game has to offer! If you love the excitement of a high-speed chase, then you are sure to love The Wild Chase video slot. Get ready to hunt down cash, jewelry, diamonds and more in this 5-reel, 3-row slot developed by QuickSpin that has 25 fixed betting lines. 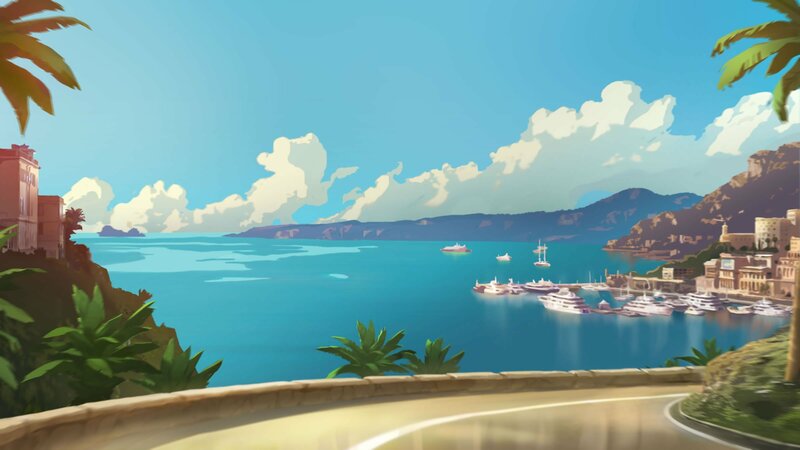 Wild Chase has classy designed symbols on its reels, which are set on a background that appears to be a millionaires’ seaside playground, with large houses on the hills surrounding a sunny bay. The slot has an Autoplay feature that you can program with the number of game rounds you want and it spins the reels for you automatically. The main game feature is the Respins. After any winning combination occurs, all winning symbols will lock into their place and the remaining symbols will respin. This is a fantastic feature because as the respins take place, often, more matching symbols add onto the existing combinations that remained fixed and this just keeps growing your winnings. The feature continues till there are no more winning combinations. Note that Bonus Scatter symbols do not trigger respins. This video slot features nine base symbols which are all related to the theme. The Wild Chase symbols are two female and two male characters, a money clip, a bag of diamonds, car keys, a watch and a diamond ring. There is also a large gold ‘X’ with ‘Wild’ written across which is obviously the wild symbol and substitutes for all other symbols except for the scatter bonus icon. The scatter bonus symbol is a roulette wheel with the word ‘Bonus’ across. The Wild Chase has a Multiplier Wild feature. The Multiplier Wild can substitute for any symbol except the Bonus Scatter symbol. The key attraction of The Wild Chase video slot is undoubtedly the free spins bonus, which is activated whenever you land 3 or more of the Bonus Scatter symbols in any position on the reels. The other way to activate the Free Spins is to collect Bonus Scatter symbols during the respins, which means you don’t necessarily need to get all 3 Bonus Scatter symbols in a single spin. This is a huge benefit, because getting symbols at once is extremely rare. Once you do trigger the free spins, you will be rewarded with 10 free spins, plus during the spins, you are guaranteed a Multiplier Wild. In essence, all of your free spins may gain a multiplier of as much as 5x. What’s more, the re-spin bonus also applies to the free spins, increasing the winning potential further. You cannot win or retrigger additional free spins during this feature. The Wild Chase does not have any fixed jackpot or progressive jackpot linked to it, but the respins and multiplier wilds ensure that you still have a chance to get some massive winnings out of this fast-paced, glamorous game. The Wild Chase features 25 betting lines in total, giving you multiple winning combination opportunities. The theoretical return to player is 96.72%. The Wild Chase is a low to medium volatility slot. During our review, we had many small wins regularly, but we didn’t see the bonus feature or free spins that often. 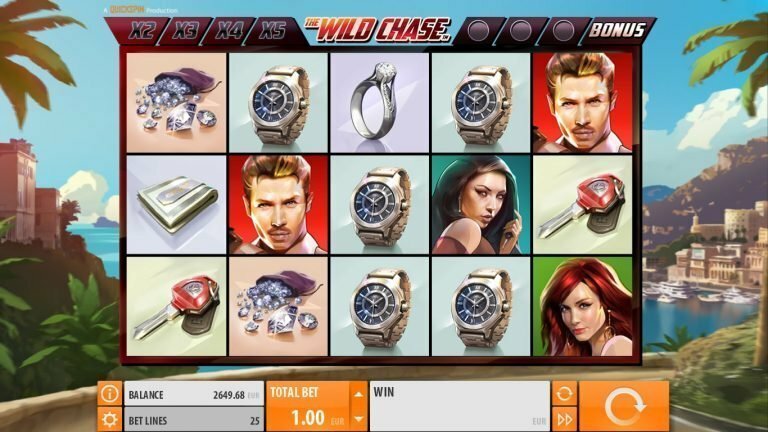 The Wild Chase is a highly enjoyable video slot with a range of features that keep you well entertained. Although the game’s volatility is relatively low, you can still have some pretty big wins when you play, thanks to the wild multipliers that come into play when you get the respins. Overall, this is a good slot; the imagery is excellent and the animations are not too bad either. Is this the best slot ever from QuickSpin? No, but it is definitely worth giving it a spin or two.